October salmon fishing at the Kola peninsula. These problems become critical within the next days. With the stabilized level of water the water temperature has a tendency to lower . After a night frost water has cooled to 6 degrees. It was noticeable that the salmon became harder to enter the river from the sea. Leaping salmon became visible around the lower portion of the river. At the same time , it became apparent that in areas with fast flowing salmon flies become conventional to ignore when I present it near the surface. Perhaps the fish became less active and preferred to stay near the bottom. It is possible that some of it has to prefer areas with more calm and deep water. On this one might have thought , watching the cluster of fish jumping on the broad and deep places below the falls. In this case, the most successful was the way to catch a salmon by provocation with fast motion flies . Quick presentation of the fly up or across the current often led to increased salmon and biting . The fish often come out to the surface with numerous , often ineffective bite. At the same time, has been steadily growing percentage of bites and unhooking after a few seconds of combat . Iin the case of sunray shadow flies we could think of too large wings. These days there is an problem with anglers who have had problems with casting . 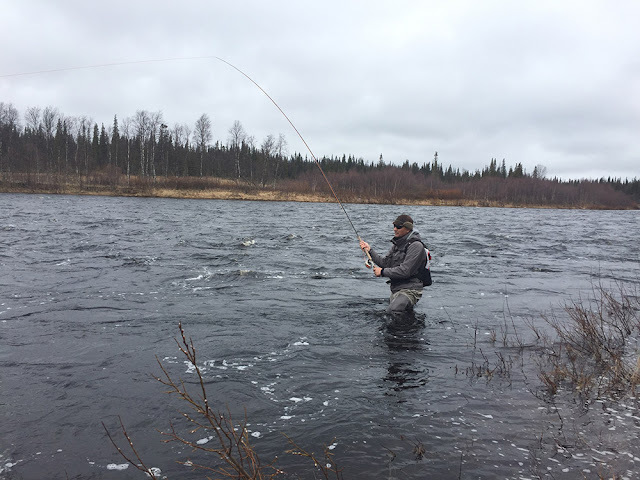 High or fast water can forgive errors in the execution of cast, but now the situation on the river proved to be particularly difficult for those who have used the standard two-handed rods for Spey or Scandy lines. False casts or untidy drop of the line on the water instantly kill fish interest in what happens . Some anglers used very long tippets , increasing the distance between the line and the fly . Another option was to shorten the leader and tippet up to 2.5 meters and win in presentation and flies control .I'm more like the second option, in which it is more convenient very carefully, systematically and carefully fishing on the entire territory of the pool. The use of long leaders and tippets often leads to loss of orientation in the position of flies, which are very critical when fishing in restricted areas on the area of the river.